A couple have bought back and restored their first family car after selling it an incredible 25 YEARS ago. 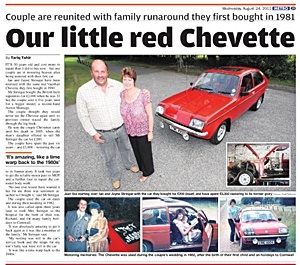 Jayne and Ian Stringer first bought the red Vauxhall Chevette in 1981 and used it during their courting days, for their wedding and even to dash to hospital for the birth of their first child. The apartment that Madeleine McCann was kidnapped from is being used by FAMILIES for the first time since the crime. A couple and their young child were spotted in Apartment 5a of the Ocean Complex in Praia da Luz, Portugal, which has been empty since the snatching in May 2007. 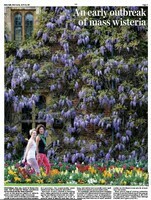 Wisteria is producing exceptionally stunning displays in Britain’s parks and gardens this year thanks to a long cold winter and the unusually warm April weather. Its beautiful lavender and violet blooms which usually signal the start of summer have surprised gardeners by opening TWO WEEKS earlier after the UK’s mini heatwave. A girl who suffered horrific burns to a THIRD of her body has bravely bared her scars for the first time this summer – eight years after the fire which killed her two cousins. After years of pain, agony and hiding away, Vicky Chaundy, 16, has stunned her family by courageously stepping out in T-shirts. The teenager suffered third and fourth degree burns from her neck to her tummy and on her hands and arms in the fire when she was just eight years old. Her left hand was so badly burnt doctors initially wanted to amputate it and she has had skin grafts and operations every year since the accident. A 10-YEAR-OLD schoolgirl who is fluent in FOUR languages has become the youngest interpreter to work at the European Parliament – and she is BLIND. Alexia Sloane lost her sight at the age of two after she was diagnosed with a brain tumour while on holiday in France. 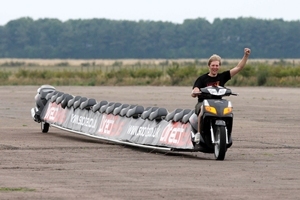 A plumber has built the world’s LONGEST motorbike – which is an incredible 22 metres (72ft) long. Colin Furze, 31, spent a month building the 25-seater scooter, which is as long as a TENNIS COURT. Supermodel Lily Cole has DYED her trademark natural red hair for the first time. The 22-year-old, who is known for her firey orange locks, was spotted with dark BROWN hair after returning for the new term at Cambridge University. Lily, whose combination of porcelain skin and red hair initially captivated talent scouts when she was just 14, was seen hiding her new hairstyle under a bright orange hat. Police are investigating after a man and woman were killed when their car went over a 100 metre cliff on the Isle of Wight. 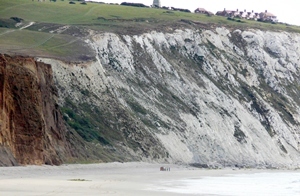 The bodies of the couple, who are believed to be locals in their 40s and 50s, were recovered from an upturned blue MPV-type car at the foot of Culver Down cliffs between Bembridge and Sandown. Comedienne Jennifer Saunders has made her first public appearance at a charity event since ditching her wig. The Absolutely Fabulous star, who has won her battle against breast cancer, showed off her new short blonde hairstyle as she started the Chariots of Fire race in Cambridge. The 52-year-old has been throught eight months of gruelling chemotherapy and radiotherapy since discovering a lump in her breast. 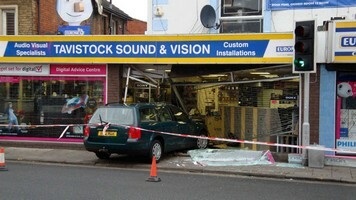 This misfortunate pilot must have thought “Oh Fokke” when he landed his vintage tri-plane on its NOSE. The man had been flying the famous Fokker Dreidecker aircraft at the Flying Legends airshow at the Imperial War Museum in Duxford, Cambs on Sunday (July 10). 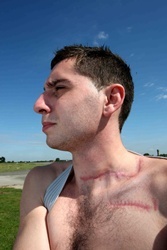 A man who almost beheaded himself in a horrific chainsaw accident has spoken about how he was only minutes from death. Tree surgeon Tom Connelly, 21, miraculously survived after he cut through more than a third of his neck and severed his jugular vein in the accident at work in April. The OLDEST rose growers in Britain are celebrating after the hot sunny weather caused their bumper crop of flowers to bloom an incredible THREE WEEKS early. Cants Roses, which were established in 1765, say it is the best year for roses in living memory and the earliest their field of flowers has blossomed in 35 YEARS. Owner Roger Pawsey says the long sunny days have made this year’s crop of roses more vibrant and colourful than he can ever remember. 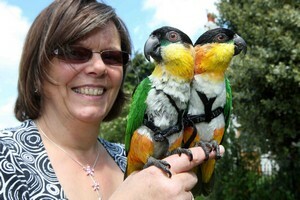 A British birdwatcher has become the first in the WORLD to successfully find all 32 species of the planet’s most SECRETIVE birds in just 12 months. 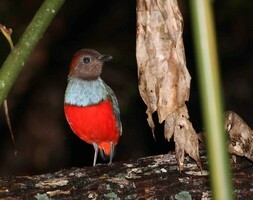 Chris Gooddie has stunned birdwatchers by tracking down every species of the rare and elusive rainforest bird, the Pitta, in a year. A 12-year-old boy is wearing a SKIRT to school today in protest at a uniform ban on shorts. Chris Whitehead plans to wear the short black girl’s skirt for his classes at Impington Village College, Cambs, because he believes its “no shorts” policy discriminates against boys in the summer. The Year 8 student, who has borrowed the skirt from his younger sister, said wearing long trousers in the heat is affecting his ability to study in class. The cold snap may be causing misery for most but this happy little ice baby is at home in the snow. Just eight months after Finley Burton was FROZEN to save his life, the tiny tot is back in the cold and looking forward to his first Christmas.